Andy Watching the Rain., originally uploaded by Here in Van Nuys. 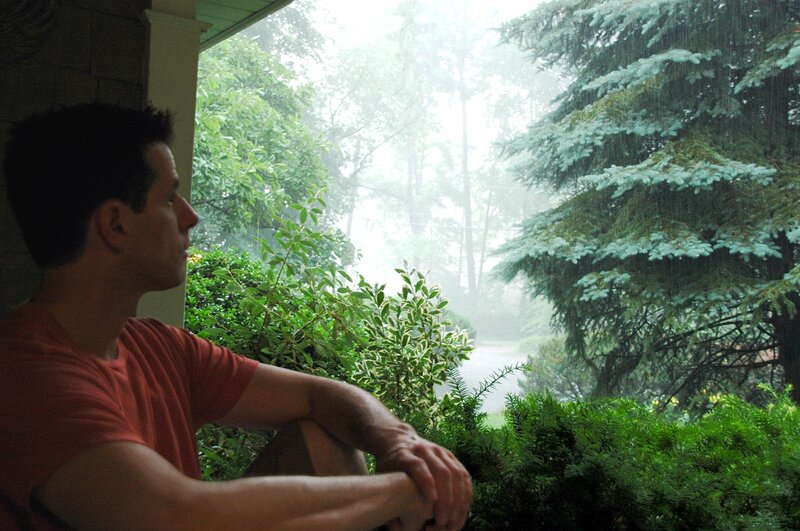 One of the privileges of spending time at this tree rich home in Woodcliff Lake, NJ was to sit on the front porch and watch the rain. Since we moved here in 1979, there was always a connection to the outdoors to thrive on. Sitting amidst a lush conglomeration of woods, the house was part of the green shady forest. The newer, uglier, grosser McMansions that were cruelly bulldozed and grafted onto this once hidden lane, are exposed to the hot sun, and require multiple air-conditioners to cool down their “great rooms” and their seven bedrooms. But not this 1965 non-air-conditioned Dutch Colonial. Inadequate with its tiny bathrooms and crooked windows, it nonetheless charms me to this day when I unhook the front Dutch doors to let the wet, humid, woodsy air inside. An aged attic fan, noisy and disruptive, struggles to make a blowing breeze blow. We are selling the house, (and moving the folks to the “Golden State”) and discovered that the old oil tank, disconnected, sits buried underneath the garage windows, and will have to be disinterred and removed. The way they once built homes in America: were they trying to teach morals in the too small showers, sparse and unlit closets, and by making us go outside to get into the garage? Oil heat, gurgling steam pipes heating the bedrooms. Lest we be too comfortable…..
What builder would even bother these days to sell a house where talkers and dreamers might congregate under the eaves to watch the winds bring in another storm? Those lives we lead now, with shoulders hunched and leaning into the online, what do we know of the outdoors with its wily moods and sudden fits of wind, leaves and the onrush of meteorological madness? I sat here again today and watched a violent front attack from the West. But it has passed and left, a great performance forgotten but to be repeated again…for eternity. Hey, Private Eyes, I’m watching you. I see your every move! Sad to hear of the impending sale. If you can remember I spent one Saturday there with you in about ’82. A really nice neighborhood. ← "She Lacked the Grace to Congratulate."